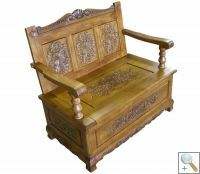 Handcarved Bench with Storage. Welcome to Grand International Decor Ltd. - Trade Chinese Furniture. Also Available in Cream and Black!